Culinary Arts is a special kind of education. The culinary profession, as a whole, has a language all its own that can be translated and understood in any part of the world. 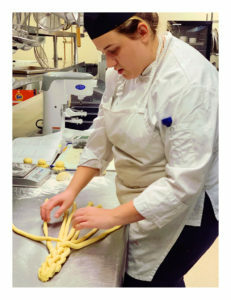 Kara van Emmerik, Sous Chef and Instructor in the Culinary Arts program at Eastern Maine Community College (EMCC), knows that language all too well. Chef van Emmerik is a graduate of the EMCC Culinary Arts Program, Class of 2014, and has returned to teach a fresh batch of talented students. 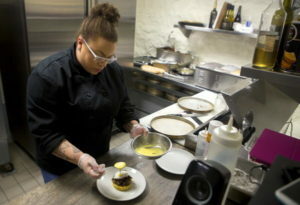 She has poured passion and dedication into her twelve years in the food service industry from working as Sous Chef at El El Frijoles in a from-scratch kitchen, to opening Dudley’s Refresher in 2015, to being named Maine Chef of the Year by Eater Maine. One of the classes Kara van Emmerik currently teaches is the Classical European Pastry Arts course, where students learn to hone their baking skills in a precise, challenging way. Being able to work with students who see pastry arts as intimidating and have them change their mind to where they love the niche at the end of the course, is one of the many reasons she loves teaching this curriculum in particular. Kara started teaching because she wanted to find a deeper meaning in her passion for food. She is a proponent of the idea that food is a universal language that has the ability to make people incredibly happy. Teaching is her way of sharing that profound love for the culinary arts with the next generation of chefs in the hope that they go on to be successful and touch the lives of others with their creations. She says to future students that “through this program, you will be given so many opportunities, meet so many incredible chefs and industry professionals in our top of the line Culinary Arts facility” that the experience is invaluable. She adds that the instructors in EMCC’s Culinary Arts program are what make it all possible, and without their hard work and dedication, the program would not be as successful as it is. This program has been such a focal point in Kara van Emmerik’s life and career, her hope is that every student can share in that experience when they come to Eastern Maine Community College. 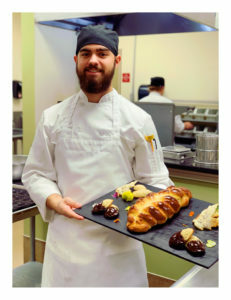 To learn more about our Culinary Arts Program, visit www.emcc.edu/culinary or www.emcc.edu/admissions to register for upcoming courses.